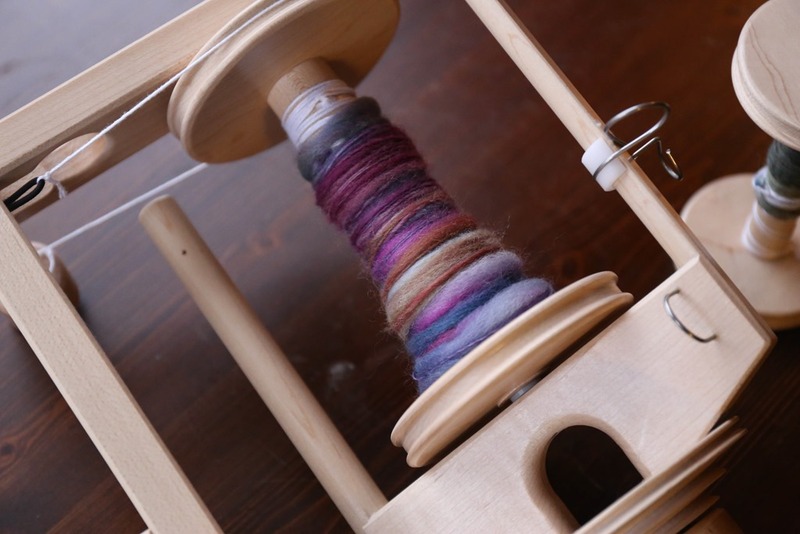 After tackling all of the core spinning, I decided I wanted to look at thick and thin yarns or slub yarns. Back to my wheel to learn more textured spinning. 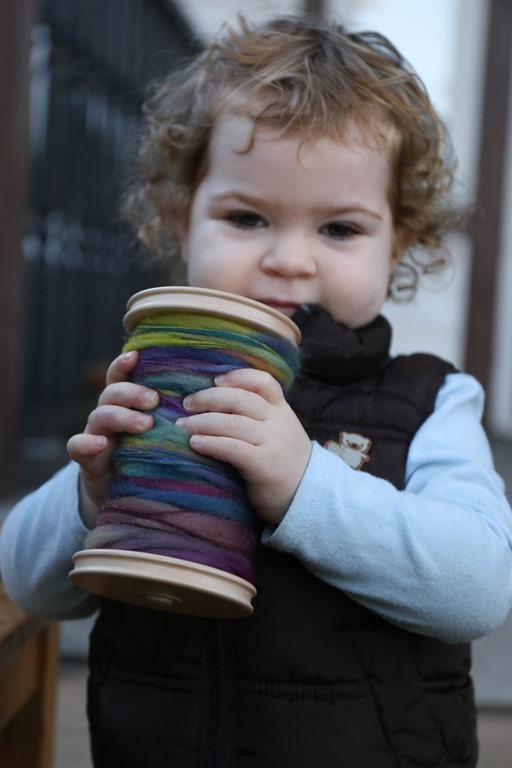 I had a very helpful little one assisting with photographing this yarn. 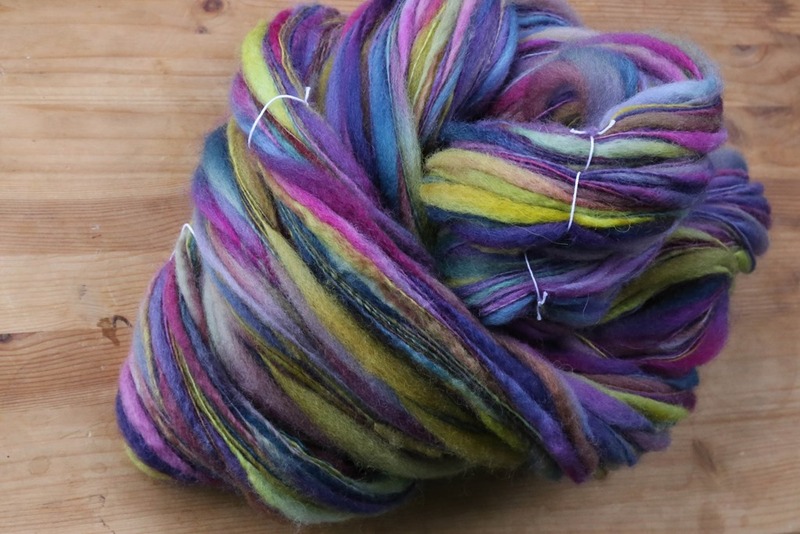 I have always appreciated the look of slub yarn but have no idea what to do with it! That to say, I thought it was time to learn how to do it anyhow. I started with a very brightly coloured 4 ounce braid from my stash that I knew I wouldn’t spin to knit with anytime soon. I set up my Lendrum with the jumbo flyer and set it to the largest pulley. I quickly had to change to the smallest pulley that the flyer would allow because I wasn’t achieving enough twist in my thin parts and it was breaking. 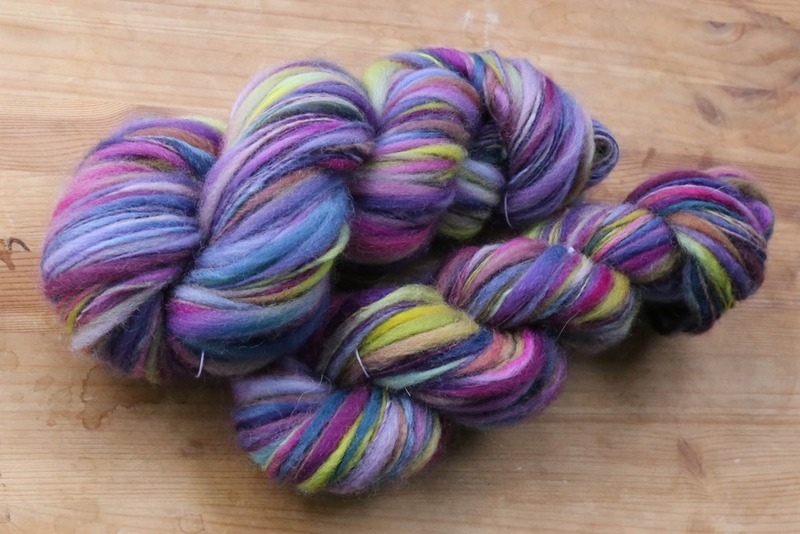 I decided to pull off some to wash and sample to ensure I had a twist-locked yarn. It was hard to tell if I had enough twist in the yarn just pulling it off of the bobbin. First textured slub yarn off the bobbin and skeined. Finished with fulling and thwacking. 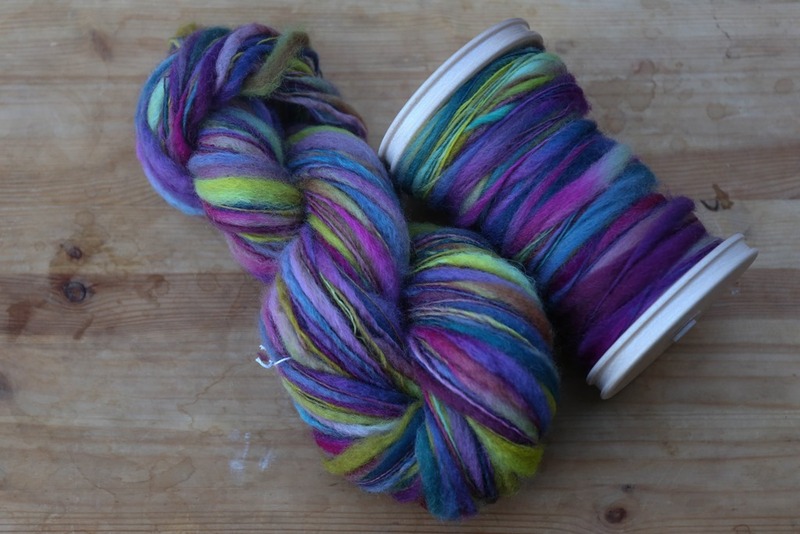 The first skein of yarn I finished by fulling and thwacking. 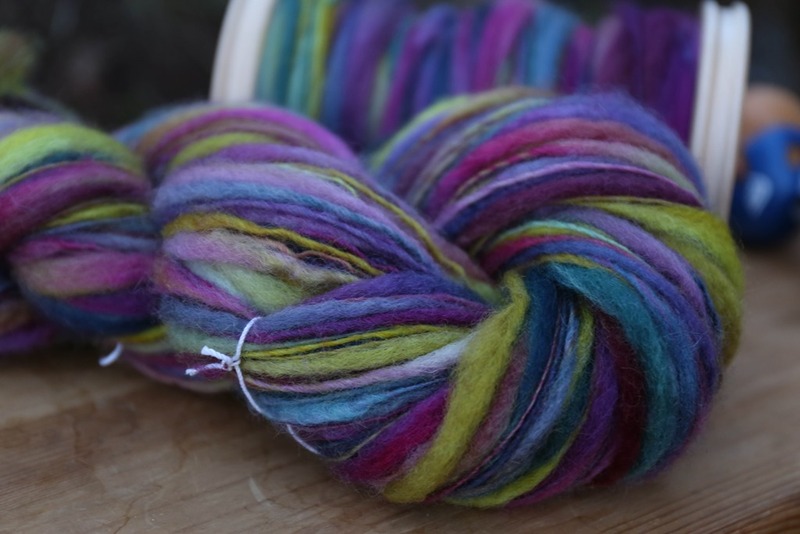 The BFL crimped up a bit once washed and created slightly more textured slubs than I’d wanted. When it had come off the wheel initially, those slubs were smooth. Wetting the yarn created that texture. After some research into how to avoid this, I decided to steam-set my second attempt. The second, and much larger skein, was steam set which chemically changes the twist and molecular construction of the wool itself. There’s a wonderful article in the Singles issue (Winter 2015) of PLY magazine which details the changes steam setting a yarn creates. It also preserved my slubs! The two yarns aren’t much different but I think the larger, steam-set skein is slightly tidier. After my experience with thick and thin or slub yarn, I’m excited to try coil and super coils but next I’m going to be working on my #ZeroToHero2016 shawl spin and my #ShackletonCAL Falkland that is still languishing on my wheel. It is starting to monopolise bobbins so I would like to clear that off! 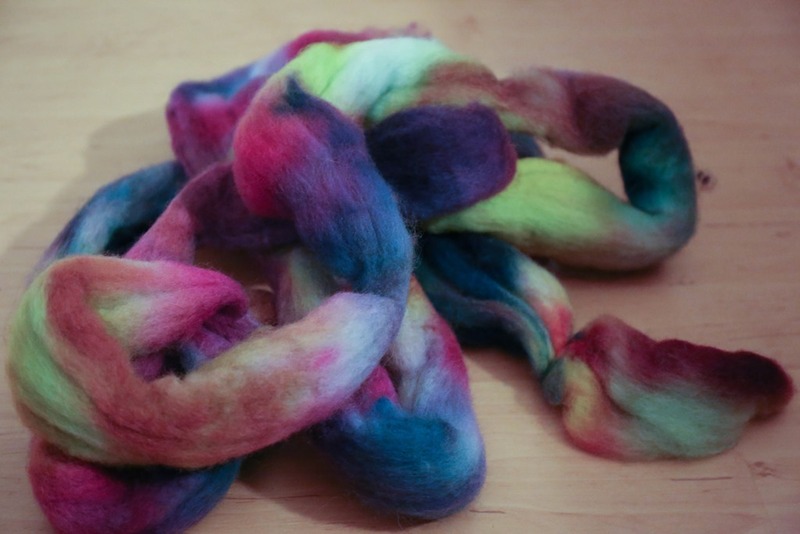 It has been fun to see what you are spinning. 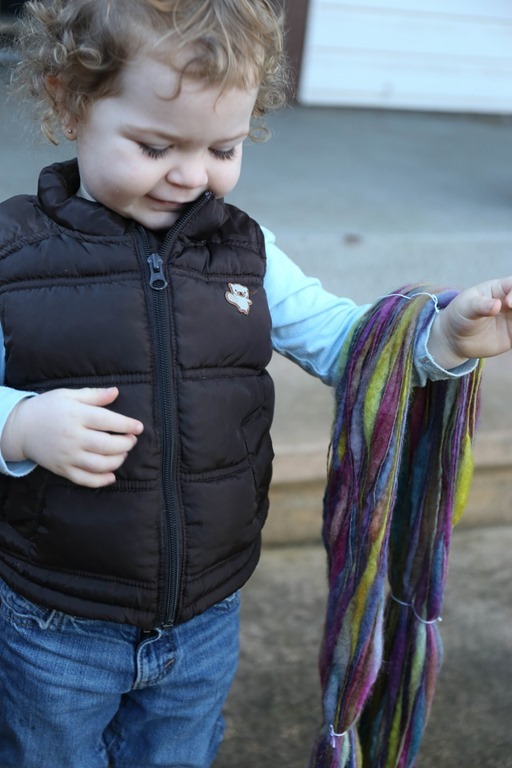 I am following Jacey Boggs class on Craftsy too. I have tried thick and thin, core spinning, beehives, etc. she is an amazing teacher . I am anxious to see what you knit with these yarns. I knitted a cowl and it turned out better than I thought it would. 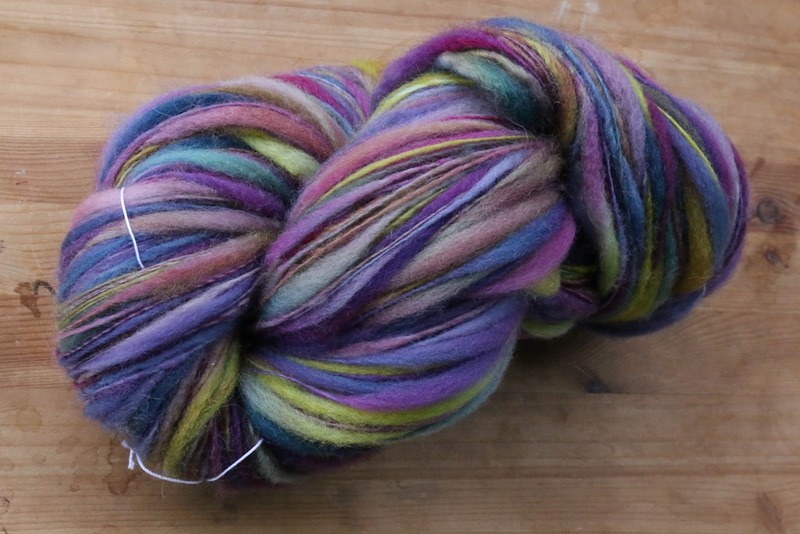 i combined it with another store purchased worsted and it gave it some body. Be sure to show us what you knit out of that beauty.